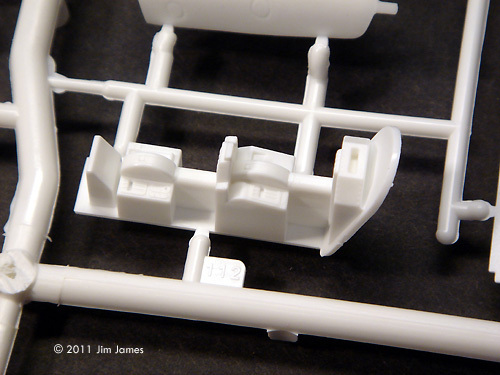 Parts: 136 injection-molded styrene parts. 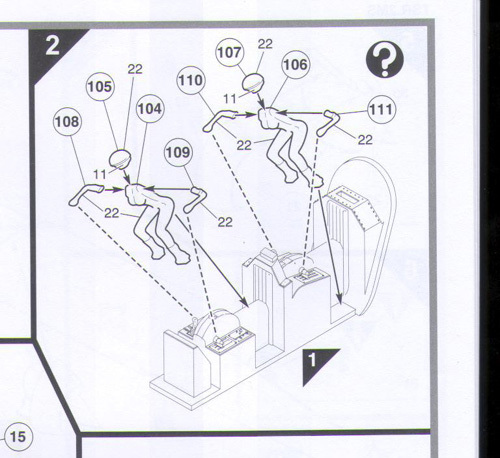 Instructions: Standard assembly booklet . Decals: Waterslide; lots of them - most of which won't be used. Overall Rating: Nice model with many challenges. 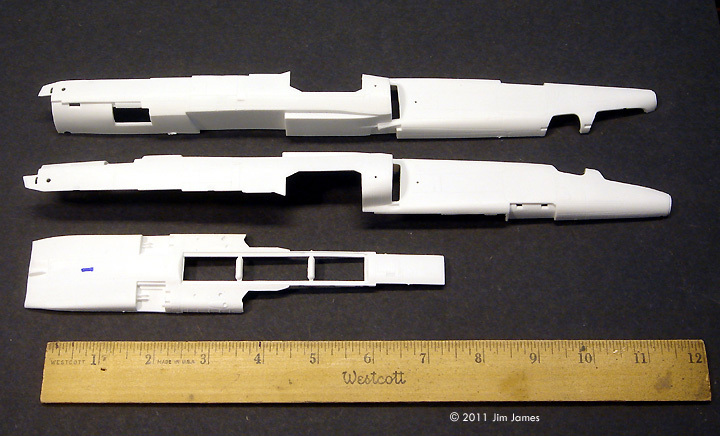 ^ Main fuselage parts. The blue mark indicates where to cut a hole for the stand. 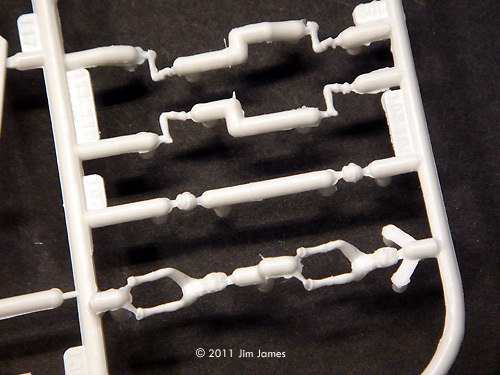 Image: Clear sprue - you only use the windscreen at top left on the MS.
A quick primer: Stratos 4” is a Japanese anime series about a group of teenagers who pilot various planes to shoot down comet fragments. They are known as meteor sweepers or MS. You can check out examples on YouTube. The BAC TSR-2 was a strike and reconnaissance jet developed for the Royal Air Force and test flown in 1964. It was also cancelled in 1964 in spite of being years ahead of the competition. Beautiful to look at, it's been a subject long sort after by British modelers. Airfix released 1/72 and 1/48 scale versions in the past three years. Both are out of production. Until now. 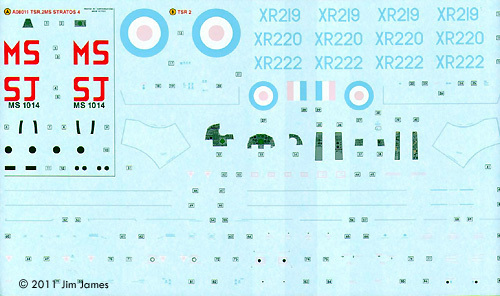 One of the principal aircraft in “Stratos 4” is the TSR-2 MS and Airfix has re-issued their 1/72 kit with a sprue of extra parts and extra decals aimed primarily at the Japanese market. A big sturdy box with 136 parts in white and clear styrene - many of which are unused. You can build the TSR-2 MS without the landing gear (it takes off from a mobile launch vehicle). You can build it with the landing gear without the ventral missile. 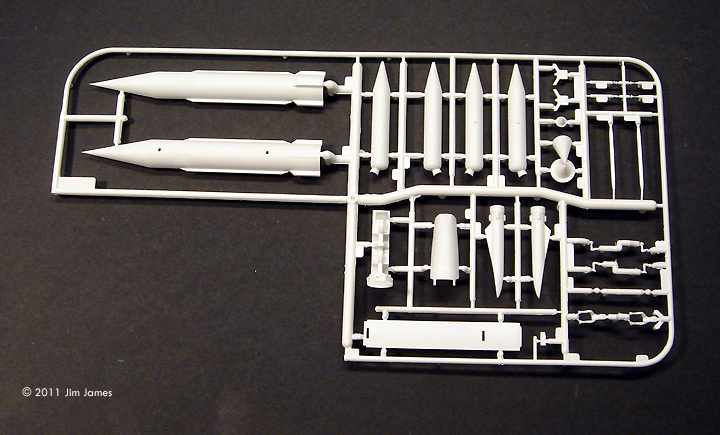 Or you can build the original RAF TSR-2. Key differences between the aircraft are the wing and tail mounted booster rockets, the large ventral missile and the choice of two big burly RAF pilots sitting upright in the cockpit or two slim, female pilots manning the cockpit like they are riding bikes (not that you can see them with the cockpit closed). Why would you pose an aircraft in flight with the gear up and the cockpit open? The instruction booklet details the MS build and the RAF version separately to avoid those uncomfortable optional phases. There are color diagrams for both versions - the RAF version only has one color - white - so the color diagram is a little redundant. There are lots of decals for the RAF version but the markings for the MS are few but more colorful. OK, this a model kit made in China for a British company to be marketed in Japan. Airfix has never had a big presence in Japan so this might be a good move for them. It would have helped if someone had actually done research on what the Japanese might like. 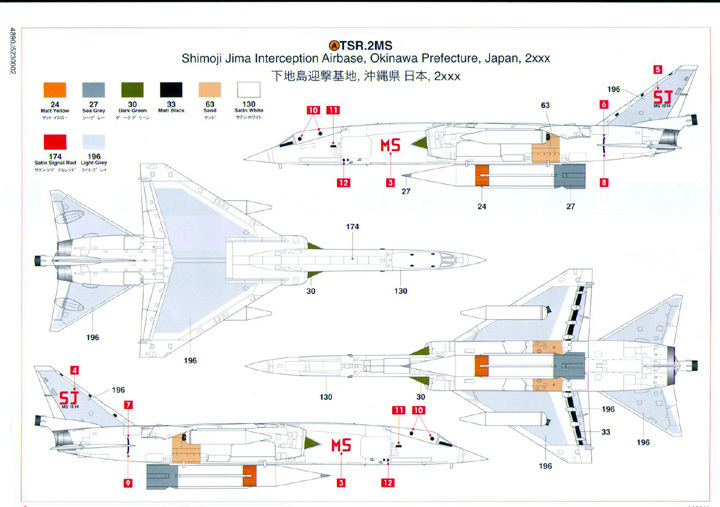 The subject is good and will probably sell well but the kit just doesn't seem designed for the Japanese. The instruction sheet has no reference to the original plane, the TV show or that there are two different versions that can be built. The paint requirements on the cover of the instructions are for the RAF version - the MS paint requirements are very different. And, of course, all the paint numbers are Humbrol paint numbers. Do they even sell those in Japan? All in all, this kit is designed for Airfix's standard European market with little or no attempt to tailor it for Japan which seems to defeat the whole idea. I built the stock TSR-2 kit when it was first issued. Actually, I started it but never finished. The part fit is really bad in several places. It's very easy to position the wing so that there's a misalignment where the wing joins the upper fuselage. Landing gear doors and airbrakes fit poorly and the fin and elevators are attached with a single pin so they can be moved (and, subsequently snapped off). You can expect to do a lot filling and sanding. All in all, being pre-warned will force me to carefully test fit the parts before assembly. I would strongly advise that, where possible, you glue any doors or airbrakes in place, before assembly, to assure proper alignment. On the plus side, the plastic reacts well to Tenax and the decals are thin and react well to decal softener. There's a good build-up review here that documents some of the hazards. Airfix provides a nice stand that can't be used for the RAF model (it interferes with the bomb bay). It can be used for the TSR-2 MS but you have to a) cut out a hole (not pre-marked) and b) heavily weight the stand since it supports the tail and has to balance all the weight forward of that point (most of the aircraft). Pros: This is a great looking aircraft so I don't know why you wouldn't want one. It's a nice size and builds in one of two attractive versions. It looks reasonably accurate - at least for the MS version. Nice decals. Cons: Atrocious part fit. Careful test fitting and some pre-assembly will help you see and avoid some of the fit problems but be prepared to fill and sand. Many thanks to wallet for providing the review samples. Manufacturers and retailers, interested in getting your wares reviewed and publicized on a site averaging 6000+ readers a day? Contact us! This page copyright © 2011 Starship Modeler. First posted on 14 February 2011.